Hello everyone, today's card is part of a blog hop to support a new stamp company called Heffy Doodle. Their designs are super cute, smart and original, what else can we ask for? 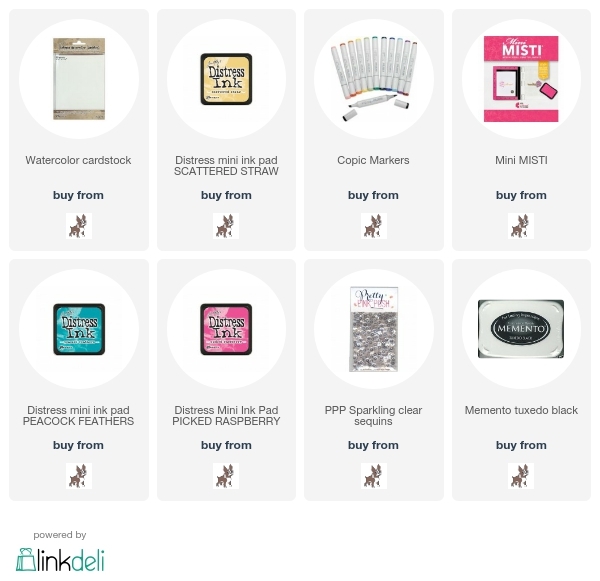 You can check their first line of products here, and help get them started if you want. ¡Hola a todos! La tarjeta de hoy es parte de un "blog hop" para apoyar a una nueva marca de sellos llamada Heffy Doodle. Sus diseños son super bonitos, originales y divertidos ¿qué más se puede pedir? Podéis ver su primera línea de productos aquí, y ayudarles a lanzar su marca si queréis. For my card I have used the stamp set "Elephant of Surprise" with its coordinating dies. Isn't that sentiment absolutely genius? Para hacer mi tarjeta he usado el set de sellos "Elephant of Surprise" con sus troqueles. ¿No os parece divertidísimo el sentimiento? The card itself is quite simple to make. I used Distress Inks to create a fun background and colored all the images with Copic Markers. After stamping the sentiment I attached everything to the card and added a few sequins. Como véis es una tarjeta bastante sencilla. He usado tintas Distress para crear un fondo divertido y he coloreado todas las imágenes con rotuladores Copic. Una vez estampado el sentimiento, he pegado todos los elementos de la tarjeta y he añadido unas cuantas lentejuelas. Lesley, the owner of Heffy Doodle, is giving away a really cool cotton tote and a set of 12 Distress Oxide Inks to one lucky winner. All you have to do is leave a comment here before 12am BST on 20th July. The winner will be announced on 22nd July on the Heffy Doodle Blog. And if you leave comments on the other stops of the blog you'll have more chances to win of course! Lesley, dueña de Heffy Doodle, sortea una bolsa de tela muy chula y un set de 12 tintas Distress Oxide. Solo tenéis que dejar un comentario en esta entrada antes de las 12am BST del 20 de julio. El ganador se anunciará el día 22 en el blog de Heffy Doodle. Y si dejáis comentarios en cada parada del "blog hop" ¡tendréis más oportunidades de ganar! Very funny card and marvellous background. Wow - what an amazing card! Love the pop of color behind the adorable elephant. The design of your card is so striking and eye-catching! Great use of color and now I love the elephants too! Such a cute card! I love the color combination! Amanda, I love your brilliant colors that make that birthday elephant just POP off the page. He is adorable! Love the design of this card. The spatter background just LOOKS like a party! I love the colours used and then the elephant placed on top with the cake on his head adorable love it. I love the colors on your fun and cute card. Great colors, fun images, balancing acts and puns. Looks like a perfect card to me. Thanks. That image and sentiment is so cute, and I love the happy and creative colors you added to make it look so cheerful! Such a cute birthday card! If this card doesn't say "HAPPY", I'll eat my shirt!!! 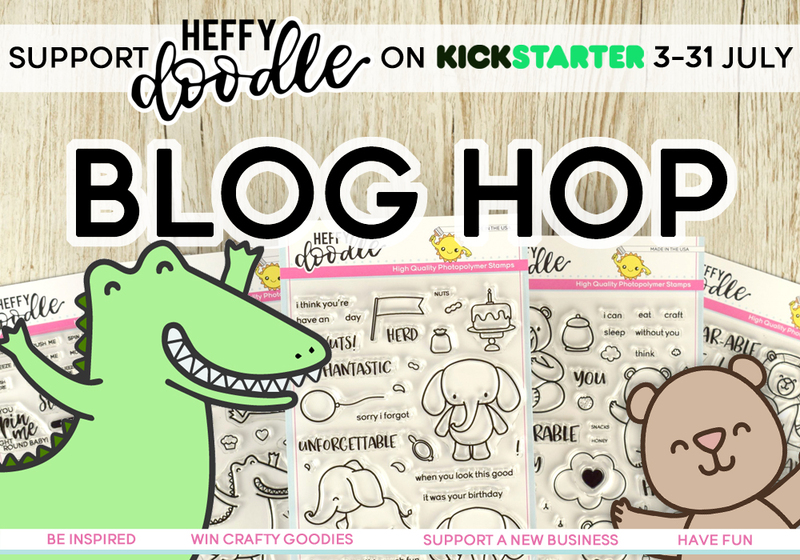 Congratulations to Heffy Doodle and I hope that the campaign is a huge success for them! Love the bright colors behind the elephant . Who wouldn't smile if they got this card? Thanks for designing with these wonderful new stamps! Such a super card I love the colours, can't wait to get my hands on the stamps. Such a cute card and I love the colorful background! Me chifla Amanda, la tarjeta preciosísima, como siempre fiel a tu estilo! Los sellos me encantan, el otro día vi un video presentación y a cuál más bonito! Intuyo que esta marca va a tener éxito! Y qué gracias me ha hecho el sentimiento! jajaja, muy bueno! YEAH for the bright colors..your little elephant makes a very happy card. This is so cute. I love the elephant. Love the elephant with his cake hat. Thanks for sharing your card I love the way you did the splash of colour like the elephant is painting its soo cool. Love this card the colors are so bright & fun! The elephant is so adorable! Cute and bright! Such cute critters! And clever sayings! Darling image and love the background. Love the background. A cute birthday card. OMGoodness your card is adorable!! Love the sentiment and have to admit, I have a softness for elephant stamps...how CUTE!! I love this card, what a fun card, great bkgd. Gorgeous use of colour and I'm sure I've never seen an elephant have this much fun before!! Such a bright combination. Who wouldn't love this and hang onto it? Your card is adorable, love the colors! Very cute card!Love the sentiment!Thank you for sharing. What an adorable elephant.. and cute sentiment as well. Liking the stamp designs. Totalmente enamorada de la tarjeta y de ese elefante por dios !! Es ideal. This card is adorable! I love the bright colors! Love how you used the same colors for the background and balloons. So cute! Love the elephant and sentiment! Pretty colors! It is adorable, and I love the color scheme! Gorgeous card - love the colours! Haha, love your fun card, the scene goes perfectly with the fun sentiment, and I love the colours you used! The stamps are so cute, and really pretty card! these types of fun backgrounds are always my fave! Cute card! I LOVE how you did the background. Ooooooooooo! Sweeter than a bowl of sugar! Totally adorable beyond words! TFS! Adorable card! Love the sentiment. I love your color combination so much !! Too cute! Love the splatter background! IRRELEPHANT is my favorite sentiment of all-time! Love the colors in your card. So bright and happy. Thank you for sharing. Oh my GOODNESS Amanda, this is the first I have heard of this company (or this hop!) so if this cute elephant and that awesome sentiment is any indication of what they produce, it is going to be a definite HIT! Your card is SO CUTE! I can't wait to check it out. TFS! So festive. I like the cute elephant and the colors. So sweet, I love the smooshing! I love the background! It's so vibrant and beautiful! Lovely card there! Loved it. Thank you for sharing with us! I just love the colours on this card, so pretty! That funny elephant looks cute too. What a fun birthday card. This is my favourite stamp set & what you've done with it is just lovely! One layer, lots of white space, but not too much, & soft colours. I wish this company well. Oh I love this so much. The stamps and colors are amazing! Love the elephant card which is my favorite critter of theirs. Very cute. I love your elephant card. Oh my goodness! I love how your card came together! The colors are amazing! Esta muy bonita!! your card is very beautiful! Thank for sharing! Great card, your coloring and background is great! So cute & funny! Love it! Omg...I loooove this card...it's so lovely! Those colours remind me of ice cream cake! Such a proud elephant! Awesome card, love the background! I love learning about the NEW stamp company, Heffy Doodle! Loveeee this! The distress inks colors blended so well together! Definitely a happy elephant! Your card is very Cute!! Will have to try it when I get my stamps. This is amazing! My favorite! I love the colors! And the elephant is so adorable! The colors here ar so pretty! Such a sweet new brand!!! Love your stunning card!!! I'm in love for the gorgeous colors you used!!! This is a great card...love the gorgeous background you created for this cute elephant. Absolutely stunning card. Amazing background colours. I need these elephants and the distress oxides. Thank you so much for sharing. Awwww...this is so adorable! Love the bright background colors! Great showcasing of the "Elephant of Surprise!!" Love the color combination and the elephant is too cute! Love your happy card, so gorgeous, and beautiful colours. Oh, gracias Dennice! Seguro que nos vemos en más blog hops! Te mando un abrazo!